Keio University Hospital in Tokyo after specialists saw that he wasn't developing amid a 24-week scan. They decided to operate for fear that his life might be in danger. The baby, who could fit into his doctors' hands, was treated at a neonatal intensive care unit where medics got his weight up to 7.14lbs (3.2kg). The Sun UK reports that last Wednesday, he finally left hospital - two months after his actual due date. The little boy was kept in hospital where his weight and breathing could be monitored, and where he eventually got the strength up to start breastfeeding. 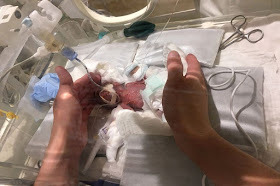 The paediatricians who treated the baby are hoping that his incredible success story will give hope to parents whose children are born very prematurely or too small to go home immediately. "I want people to know that babies can return home vigorous even if they are born small," Dr Takeshi Arimitsu told Kyodo News. This little baby takes the crown for the smallest baby in the world from the previous record-holders in Germany.